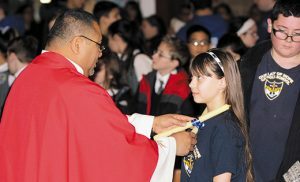 Father Rene Canales, parochial vicar at Our Lady of Hope Parish, Blackwood, blesses the throat of a student after Mass on Feb. 3. 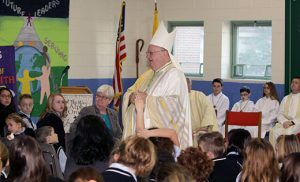 The school was one of several Bishop Dennis Sullivan visited for Catholic Schools Week. A highlight for staff in the Office of Catholic Schools is taking part in the events and activities in our schools across the diocese. The week was an affirmation of our work and the work of our schools to be “communities of faith, knowledge and service.” I began the week with the Good Shepherd (Collingswood) community at Sunday’s opening Mass, which was followed by a pot luck breakfast. It was a warm, family-oriented celebration. 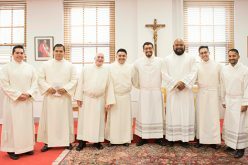 Saint Vincent DePaul (Mays Landing) had a Mass on Thursday to celebrate vocations. It was inspiring with so many energetic young students. I also got to see “Shrek Junior” at Resurrection (Cherry Hill). I’m not kidding when I till you these kids were as good as Broadway. They are so comfortable with who they are. The week ended for me at Our Lady of Hope (Blackwood) with Bishop Dennis Sullivan; Father Robert Hughes, vicar general; and Father Michael Romano, secretary to bishop and the parish priests, who are all so supportive of our schools. It was the feast of Saint Blaise, so we left after the blessing of the throats. That was an added bonus in a week already filled with so many blessings. I was lucky to see the eighth grade presentation at Saint Teresa (Runnemede), inspired by the film “Hidden Figures.” Students highlighted the careers of 10 African-Americans, including the three women in the film. In front of the entire school, they brought to life individuals whose contributions to the fields of science, medicine and the arts, have gone unnoticed in history. That same day, everyone in the school dressed as they envisioned themselves in a career 20 years from now. The activities were educational and fun, and showed a lot of creativity. At Saint Peter (Merchantville), I saw third graders and seniors compete in a spirited times table challenge. They played multiplication and division bingo with the seniors, too. Young and old were helping to keep each other’s minds sharp. My week wrapped up with a beautiful Mass at Saint Joseph Regional School (Somers Point). The week was full of love and spirit. Monday I was at Sacred Heart School (Camden), where Bishop Sullivan led a prayer service and the school choir sang. Camden City Mayor Dana Redd was there with Msgr. Michael Doyle, who has dedicated his life to the school and kids in Camden. 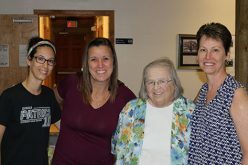 John Paul II (Stratford) welcomed me at their 2017 Way of Love Scholarship Donor Appreciation event, where they thanked more than 50 generous scholarship donors. 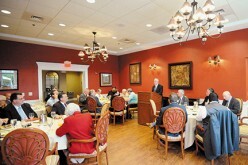 They have raised more than $132,000 in three years to benefit John Paul II students. 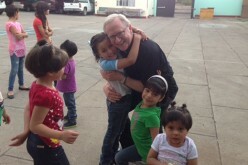 In the middle of the week I was at Good Shepherd. The theme was “Honoring Our Men & Women in Blue.” Local and neighboring police and fire departments were invited, as were “blue” school parents. Students honored their guests with songs, posters, breakfast and fellowship. At Guardian Angels (Gibbstown), I was with students as they served nearly 200 senior citizens who accepted an invitation to lunch. The school choir sang for the seniors. You could just see how much the seniors love to spend time with young people. There was a lot of excitement in the air at Saint Mary (Williamstown), with fifth and sixth, then seventh and eighth grade spelling bees. Tough competition did not break the spirit of contestants, who stayed poised and calm while working through the words. The school also held a walk-in registration event for a steady stream of interested families. Students, faculty and administrators were especially enthusiastic about a live stream open house via Facebook, planned for Saturday, Feb. 4. In Wildwood, Cape Trinity seventh and eighth graders caught a glimpse of their future by attending the high school knowledge bowl at Wildwood Catholic. A team for each grade fought to beat the buzzer and answer questions in a wide range categories (e.g., history, math, religion, current events) to earn points. Based on their answers, they are receiving an excellent education. Coming back, I stopped at Saint Joe’s High School (Hammonton) to watch Gloucester Catholic, Saint Joe’s and Wildwood Catholic compete in a forensics tournament. Bishop Sullivan was the main celebrant at Friday’s beautiful closing Mass at Our Lady of Hope. 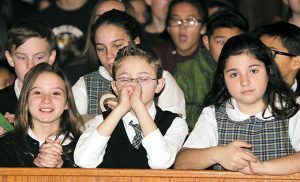 He reinforced his commitment to Catholic schools as a church full of students and parents supported the choir in song. Following Mass, sixth through eighth graders assembled casseroles to feed 800 people for the Saint Vincent DePaul Society with ingredients donated by school families. Our Lady of Mt. Carmel Regional School (Berlin) had a beautiful Mass with a student chorus and bell musicians. Father James Dabrowski spoke about Catholic schools and blessed a time capsule that will be opened in 50 years. Grandparents were honored that day too. At Christ the King (Haddonfield), students in the upper grades participated in a geography bowl through National Geographic. Winners have an opportunity to advance to a national level. Their geography knowledge was quite impressive. I visited Our Lady Star of the Sea (Atlantic City) and was struck by the transformation of the walls with student creations. The volume and quality reflect all the creative learning going on there. Sixth grade students were practicing for Friday’s Mass, and some students were praying with seminarian prayer partners. I also caught the tail end of the book fair. 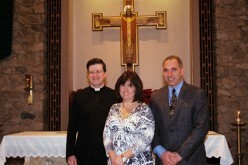 My week came to an end with a closing Mass at Saint Peter, following a PTA-sponsored Teacher Appreciation Day. At the end of the Mass, American Legion Post 68 representatives awarded winners of the High Point Coloring Contest, a patriotic coloring contest sponsored by the American Legion. It was a great week to be part of South Jersey Catholic Schools. I had the pleasure of moderating the Knights of Columbus spelling bee at Saint Michael (Clayton). The eighth graders did a fantastic job competing, with an audience of fifth, sixth and seventh graders. I also attended and photographed Masses at Saint Vincent de Paul and Our Lady of Hope, where Bishop Sullivan did such a great job engaging students. 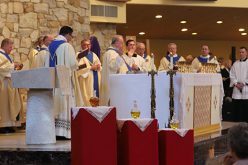 At Saint Vincent, Bishop talked not only about Catholic schools, but about the altar server who threw himself on top of Bishop Cruz in Newark to protect him from an attacker at Mass last week. Bishop Sullivan referred to the altar server in Newark as martyr-like. 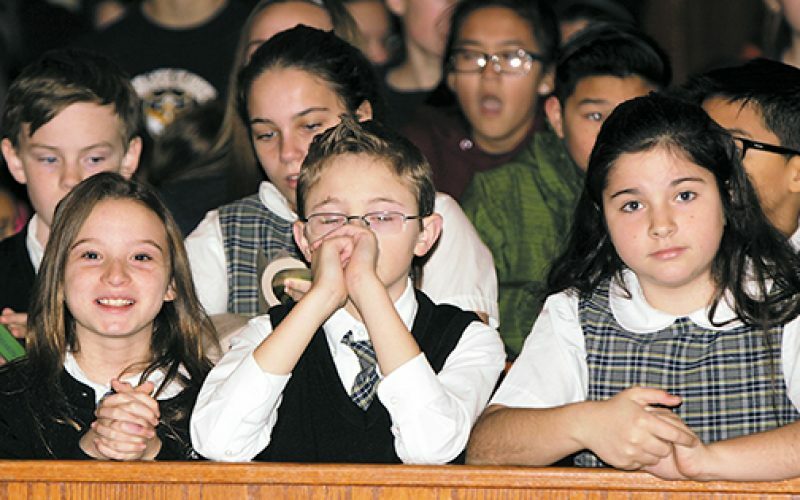 It was especially timely because altar servers were honored at the Saint Vincent Mass. Bishop Dennis Sullivan visits with students of Saint Vincent DePaul School, Mays Landing, on Feb. 2. I started my week at the Assumption (Galloway) science fair. The projects were impressive, and Holy Spirit High School (Absecon) students were among the judges. The fair is in collaboration with Stockton University, so students can qualify for regional and state competitions. Many projects had an engineering or practical aspect, so the fair was a great example of STEM integration at the school. I also caught the spelling bee at Saint Michael. Mike Walsh (Director of Communications for the Diocese) moderated, and the eighth graders made it through a lot of tough rounds. Parents and grandparents brought lunch for their students that day too. Visits to Bishop Schad and St. Mary’s in East Vineland brought my week to an end. 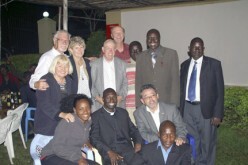 Catholic schools are supported by the House of Charity.